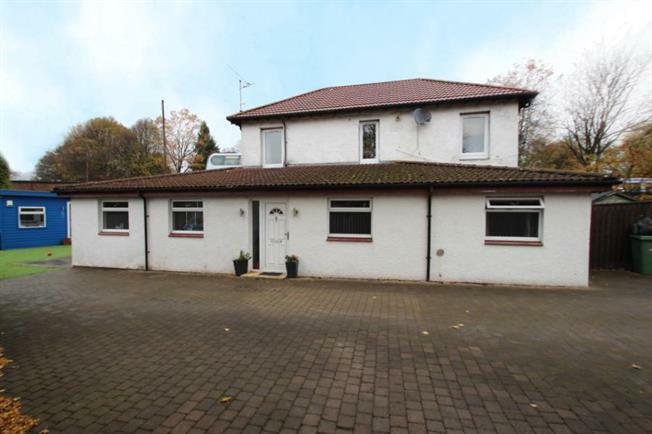 4 Bedroom Semi Detached House For Sale in Glasgow for Offers Over £220,000. If you're looking for a property all on the one level then this is the house for you. This family home, formally the station masters property. The stunning semi detached lower conversion all on the level with fantastic grounds all around the property. Accommodation comprises substantial entrance hallway giving access to all the rooms, lounge with open plan kitchen with wall and floor mounted units 5 ring hob and hood, double oven and microwave. There is also an island which is used as dinning area. The kitchen also give access out to the south facing garden which has a 30ft out house. The property also has 4 bedroom (bedroom 2 with en-suite), four piece family bathroom with separate shower. The utility room finishes off the property. Other benefits are double glazing, gas central heating and ample parking for several cars. The location is also a major feature with easy access to the Clyde Tunnel, Scotstounhill train station and M8 motorway. A range of local bus routes offer an excellent service into the West End and City Centre whilst Byres Road is also nearby to provide a further range of shopping, transport and leisure facilities. Scotstoun sports centre and swimming pool is nearby.